Obverse: ROMANIA, face value "50 BANI", coat of arms of Romania, year 2012, on background a view of the church of Curtea de Argeş monastery and some rays Reverse: bust of voivod Neagoe Basarab, a side view of the church of Curtea de Argeş monastery, year 1512 and NEAGOE BASARAB, circular inscription BISERICA MANASTIRII CURTEA DE ARGES meaning "CHURCH OF THE CURTEA DE ARGEŞ MONASTERY"
Neagoe ascended to power in early 1512, after the defeat suffered by Vlad the Younger at Văcăreşti (previous ruler of Walachia, 1510-1512) before the troops of the Craioveşti boyars (reinforced with Ottoman troops sent by Mehmet, bey of Nicopolis). Following the defeat, the former ruler was beheaded. Although being the son of boyar Pîrvu Craiovescu, Neagoe took the name Basarab, thus claiming to be descendant of the great Basarab the Founder. The prince has maintained generally good relations with his neighbors. He also went to Istanbul, and accepted an increased tribute. He concluded a treaty with Hungary and gained for himself the Geoagiu estate in Transylvania. Neagoe had three boys and three girls. Teodosie ruled Walachia for a few months after his father's death. One of the girls, Ruxandra, was married with the brave voivod Radu of Afumaţi. Stana was married with Ştefăniţă, ruler of Moldavia (1517-1527). During Neagoe Basarab's reign a Slavic Gospel was printed, the third book ever printed in Walachia. The voivod is the author of a book written in Old Slavic named "Neagoe Basarab's Teachings to his Son Theodosie". The book contains, beside some texts taken from the Bible and from various Byzantine and Slavic works, several original chapters . The prince founded, repaired and endowed with precious ritual objects and money a lot of other places of worship, both in Walachia and at Mount Athos, in Jerusalem and at Mount Sinai . Neagoe also erected the current church of the monastery of Snagov. 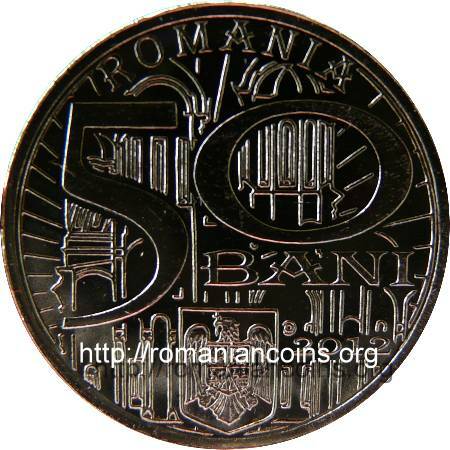 In 2008, on October 26th, Neagoe was sanctified by the Romanian Orthodox Church. This date was set for the feast day of the Saint voivod Neagoe Basarab. 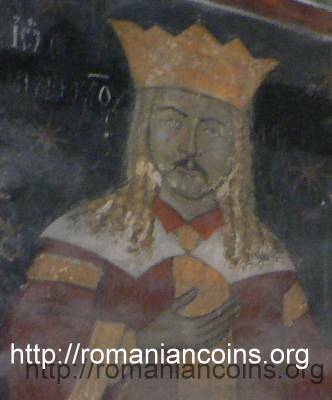 Neagoe is the founder of the beautiful church of Curtea de Arges, the church being also represented on the coin. This construction is related to name master Manole - who entered into legend as character of the folk poem "Argeş Monastery". The church was consecrated in 1517, with a particular magnificence and with a choise participation - the patriarch of Constantinople, several Orthodox metropolitans, bishops and abbots. The lavish ornamentation and the twisted spires give a very special aspect of this masterpiece of the Walachian medieval architecture. Neagoe Basarab was buried in the church of Curtea de Argeş. Between 1875 and 1886 the church was restored by the French architect Lecomte de Noüy, being prepared to become the burial place of the kings of Romania. Here rest Carol I, Ferdinand and Queen Maria, Carol II. 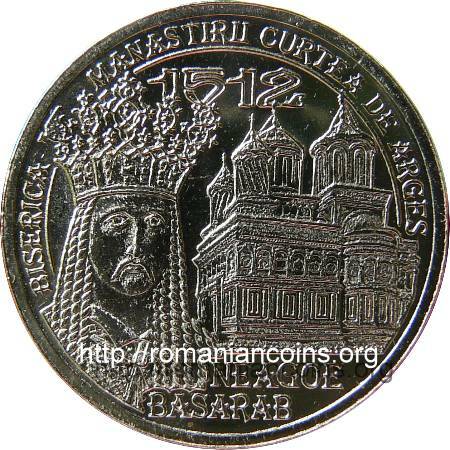 The image of Neagoe Basarab on the coin reproduces the representation of the Walachian ruler on the votive painting of the church of Curtea de Argeş (where also appear his six children and lady Elena Despina). The crown worn by lady Elena - Despina (Neagoe's wife and daughter of Serbian despot Jovan Brancovici), as it appears in the votive painting of the church of Curtea de Argeş, was used as inspiration source for the crown worn by Queen Marie (Maria) in 1922 at the coronation of Alba Iulia. The issue has also a proof variant for numismatists, with the face value of 100 lei, struck in gold.